Eurocom offers a choice of All in One Desktop computers with TPM 1.2 hardware data encryption for enhanced security, low energy consumption and a wide range of connectivity options to ensure they can integrate smoothly into a wide variety of environments. “Eurocom designed its latest line of AIO’s, including the Uno 3 and Uno 2.1, with a wide variety of unique features that set them apart from the competition including a built in battery pack, TPM 1.2, VESA mounts and adjustable stands all in an energy efficient, low power consumption design” Mark Bialic, Eurocom President. The long list of innovative features of the Eurocom All in Ones allows companies to deploy more efficient computing infrastructure for their employees than traditional desktop systems. Designed for integration into large companies, hospitals and Industrial Installations to provide an extremely energy efficient solution. The Uno 3.0 is designed for reduced energy consumption and energy efficiency with a maximum power draw of 120W. The ultra efficient 120W 100-250V Auto-switching external AC Adapter improves the overall energy conservation. The Uno 2.1 takes low power consumption to another level with a maximum draw of 90 watts with an auto switching 110-240 V AC adapter that further improves the overall energy conservation. The energy efficient Uno’s consume only 120W or 90W max versus 200W-600W for a traditional desktop PC (53W min mode, 120W max mode; 2W standby, 1 W off mode). The low power consumption equates to lower thermal temperatures which results in a longer expected lifespan of internal components. The increased security brought on by the integrated Trusted Platform Module (TPM) 1.2 in the Uno 3.0 and 2.1 can save organizations and individuals in IT management and security costs. The integrate TPM 1.2 from Infineon Technologies ensures that digital certificates, passwords and keys are made more secure from software attacks and physical theft. TPM provides the ability for a computing system to run applications more secure and allows secured remote access to perform electronic transactions and communication more safely. An integrated Kensington Lock Slot allows users to lock the Uno 3.0 and 2.1 to a secure object to ensure the security of the system. Equipped with a VESA mount, the Uno 3.0 and 2.1 can be mounted on tables, walls, desks, medical carts or nearly anywhere for ultimate convenience, deploy-ability and ease of use. The VESA mount is accessible once the adjustable stand is removed, the stand can be adjusted for viewing angles of 5 degrees to 53 degrees. An ExpressCard 54 slot in the EUROCOM Uno 3.0 and Uno 2.1 allows for peripheral devices to be connected, increasing functionality. The EUROCOM Uno 3 can double as an external monitor due to HDMI in/out ports. The Uno 2.1 also comes equipped with two RS-232 ports along with a full complement of USB 3.0, 2.0, eSATA and an external VGA port. The EUROCOM Uno 3.0 has an integrated 6-cell, 62.16WH battery pack, which provides backup power in case of electrical failure, or unstable incoming electrical current, while also allowing for easy relocation without shutdown. When AC power suddenly shuts down, the backup battery can keep you working for up to 60 minutes and/or allow users to save uncompleted documents. When AC power suddenly shuts down, the backup battery can help keep you working or to save uncompleted documents before power down. The Eurocom line of All in One desktop’s are built to last long term with heavy duty industrial grade chassis designs and high quality components. The Uno 3 and Uno 2.1 have an increased lifespan, in part, due to lower power consumption. Low power consumption equates to lower thermal temperatures which results in a longer expected lifespan of internal components. Less desk is space required due to the small, compact, all in one Small form-factor Design of the Uno 3, measuring: 527(W) x 49(D) x 370(H)mm or 21.08(W) x 1.96(D) x 14.8(H)inch and a lightweight of 7.5kgs / 16.5lbs. The Uno 2.1 is even more svelte measuring; WxDxH 450(W)x 312(H)x 53.5~151(D) mm / 17.7(W)x 12.2(H)x 2.1~6.0(D) inch and weighing 6.7kg / 14.7lbs. Equipped with a VESA mount, the Uno 3.0 can be mounted on tables, walls, desks, medical carts or nearly anywhere for ultimate convenience, deploy-ability and ease of use. The VESA mount is accessible once adjustable stand is removed, the stand can be adjusted for viewing angles of 5 degrees to 53 degrees. 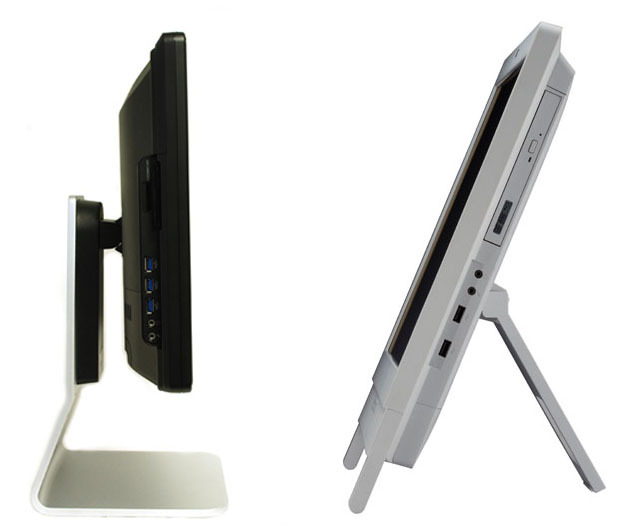 The EUROCOM Uno 2.1 has a unique adjustable stand that allows users to raise or lower as well as tilt the display to ensure very tall or very short customers have the optimal viewing angle.